Dimensions 0.25 by 10.25 by 11.25 in. Retells in verse the Indian fable of the blind men discovering different parts of an elephant and arguing about its appearance, with the blind men depicted as mice. A Caldecott Honor Book. Reprint. Amazon.com description: Product Description: "It's a pillar," says one. "It's a fan," says another. One by one, the seven blind mice investigate the strange Something by the pond. And one by one, they come back with a different theory. It's only when the seventh mouse goes out-and explores the whole Something-that the mice see the whole truth. Based on a classic Indian tale, Ed Young's beautifully rendered version is a treasure to enjoy again and again. 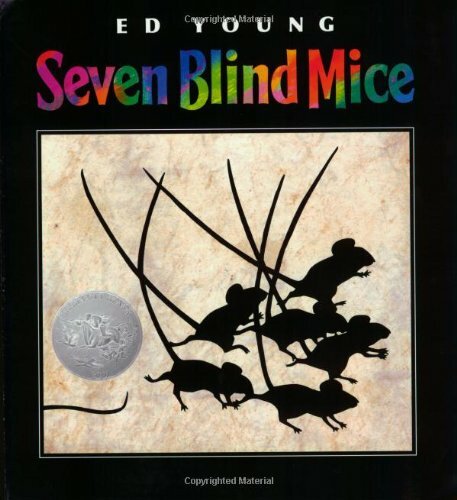 About: In this retelling of the Indian fable, seven blind mice discover different parts of an elephant and argue about its appearance.